Sign up for a campus visit and tour by visiting KU Undergraduate Admissions. To meet with KU TPE program staff, be sure to follow the instructions below. (Instructions with screenshots). Select a date and time to attend. At least two weeks in advance is best. 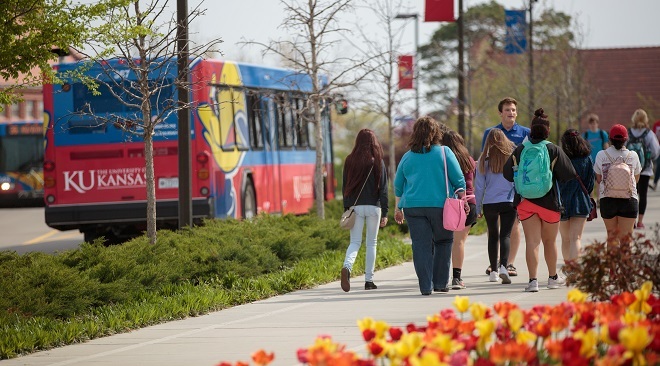 In addition to the introduction to KU and a tour of campus, you have the option to sign up for an appointment with Financial Aid and tour a residence hall. Once you select a date and time to visit, you will need to complete the sign-up form. Email Address: The email address you use on the sign-up form is where you will receive the itinerary and all visit information. ACT/SAT scores: Enter “0” in both fields. What is your intended major: Select "Undecided". Would you like to meet with an Academic Department: Click "Yes". In the blank box: Write in "KU TPE". After you have completed this, you will receive a confirmation email message. KU Admissions will organize your visit with KU TPE, and it will be added to your itinerary.